In a large skillet, heat the oil until shimmering. Add the onion, garlic and chile and cook over moderately high heat, stirring, until just softened, about 2 minutes. Add the mushrooms and a generous pinch of salt and cook, stirring occasionally, until tender and browned, about 10 minutes. Remove from the heat and stir in the epazote. Season with salt. Heat a large cast-iron griddle over moderately high heat. Add 3 tortillas to the griddle and top each one with 1/2 cup of the cheese and 1/3 cup of the mushrooms. Cook until the cheese just starts to melt, about 2 minutes. 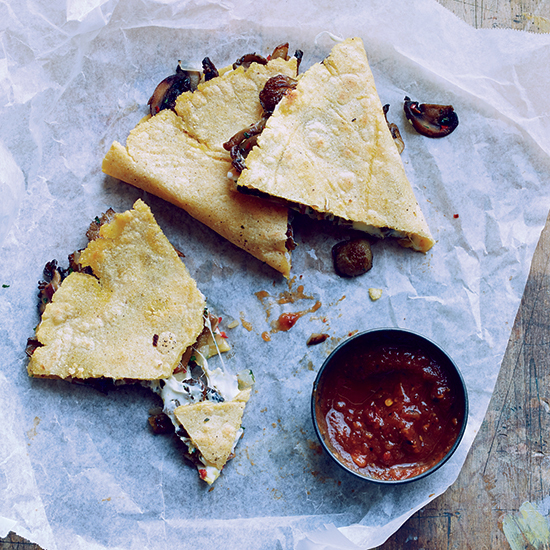 Using a spatula, fold the tortillas in half, pressing lightly to form quesadillas. Cook, flipping once, until the tortillas are browned in spots and the cheese is melted, 2 to 3 minutes longer. Transfer to a work surface. Repeat with the remaining tortillas, cheese and mushrooms. Cut the quesadillas into wedges and serve. Red salsa (homemade or store-bought) or Salsa Verde. Toasty, malty beers such as amber ales are a great match for earthy mushrooms.